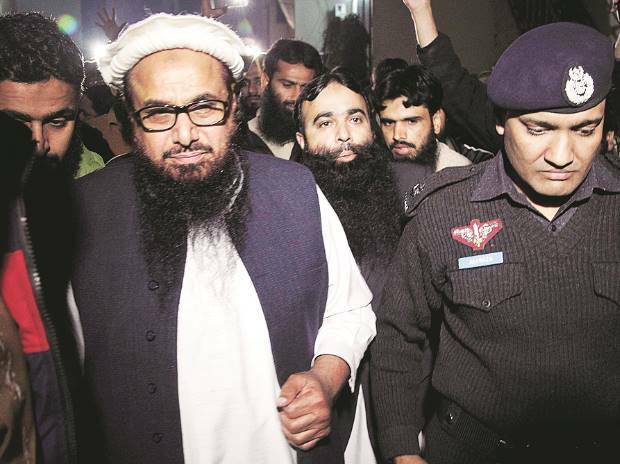 Pakistan Wednesday intensified its ongoing crackdown against the banned organisations and took control of several seminaries and assets belonging to Mumbai terror attack mastermind Hafiz Saeed-led Jamaat-ud-Dawa and its wing Falah-e-Insaniat Foundation. The confiscation of properties of Jamaat-ud-Dawa (JuD) and Falah-e-Insaniat Foundation (FIF) comes after Pakistan formally placed the proscribed organisations in the list of banned organisations on Tuesday. According to Pakistan's National Counter Terrorism Authority (NACTA) list, which was updated on Tuesday, the JuD and FIF were among 70 organisations proscribed by the Ministry of Interior under the Anti-Terrorism Act, 1997. At least two seminaries and property belonging to proscribed JuD and FIF were taken over by the government in a fresh crackdown launched by the law enforcement agencies under the National Action Plan (NAP) on Tuesday, the Dawn newspaper reported. Major actions were taken in Chakwal and Attock districts after the additional chief secretary of the Punjab province in a meeting with commissioners and divisional police heads via a video link directed the officials concerned to take over the property, it said. In a subsequent operation, the seminaries of JuD in Chakwal Madrassa Khalid Bin Waleed in the Talagang area and Madrassa Darus Salam on Chakwal's Railway Road along with their staff were placed at the disposal of the Auqaf Department. Following the Punjab government's directives, the administrators were appointed at the seminaries to take over their control. Three properties of JuD and FIF were spotted in Attock district during a fresh survey conducted by a divisional intelligence committee on February 27, the report said. The management and operational control of the properties were taken over by the district administration of Attock, it said. They were Madrassa and Masjid Musab Bin Umair in Peoples Colony, Attock. It was an under-construction structure spread over 13-kanal (1.6 acres) area and its monthly expenditures were Rs 60,000. It was taken over by the chief executive officer of the Attock district education authority. An ambulance of FIF with a monthly running expenditure of Rs 48,000 was taken over by the district emergency office in Attock. Besides, Hasanabdal assistant commissioner confiscated a 17-marla (0.10 acre) plot of the organisation on Ahmed Din Khan Road and a car bearing a registration plate of Islamabad with monthly expenditure of Rs 18,000, the report said. A senior police official of Rawalpindi division told said the government had not given any specific directive regarding the crackdown as actions were also being carried out by other security agencies under the NAP, it said. Already, government has arrested at least 44 individuals of various banned groups. Jaish-e-Mohammed chief Masood Azhar's son and brother were among 44 members of the banned militant outfits taken into "preventive detention", Pakistan said on Tuesday, amid mounting pressure from the global community on it to rein in the terror groups operating on its soil. The crackdown came amid tensions with India following a suicide attack in Jammu and Kashmir's Pulwama district on February 14 by Pakistan-based Jaish-e-Mohammed terror group that killed 40 CRPF soldiers.